The Financial Times has published the 2013 edition of its annual Global MBA Rankings. This year, Harvard leads the list, followed by MBA rankings mainstays Stanford, Wharton, London Business School and Columbia, to round out the top five. 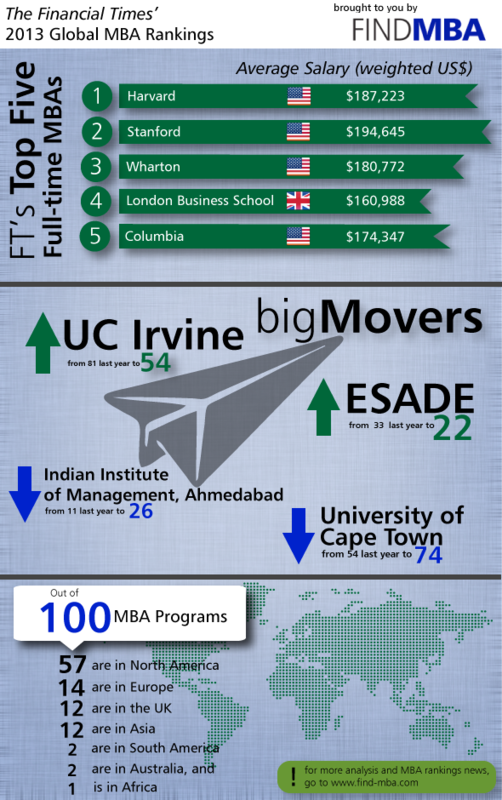 The rest of the top ten paints a more global MBA picture. INSEAD (France/Singapore) is followed by Spain's IESE Business School, the Hong Kong University of Science and Technology, MIT Sloan and Chicago Booth. Schools in India, which have made big gains in recent years, have lost ground in the 2013 ranking. The Indian School of Business dropped 14 spots to land at place 34, while the Indian Institute of Management, Ahmedabad landed at spot 26, after debuting last year at number 11. For more information, please see the infographic below, or read the full coverage on the FT's Global MBA Rankings page. You can also see FIND MBA's interactive MBA rankings map, where you can see all MBA rankings ranked by the FT and other publications.